Ngoni Mugwisi recalls the dry 110-degree heat that welcomed him to Arizona — and the United States — for the first time. 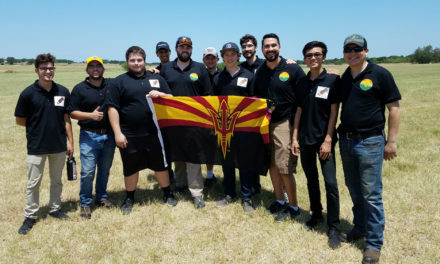 This sweltering introduction marked the beginning of a four-year journey that has seen the Arizona State University electrical engineering student achieve success in academics, leadership, social entrepreneurship and impact on the ASU community. It is the continuation of a longer journey that began in Zimbabwe with a childhood marked by the sacrifice and perseverance demanded by life with his supportive but financially impoverished mother. His upbringing in the city of Gweru, Zimbabwe was punctuated by nearly monthly evictions from one house to another. Eventually, Mugwisi’s mother and siblings were forced to relocate to rural Mberengwa, Zimbabwe, where living costs are lower. Mugwisi remained with other family members in Gweru, where the education system was better — though he was frequently excluded from school because he was unable to pay the required fees. Mugwisi still managed to excel in school by borrowing books and class notes from other students. 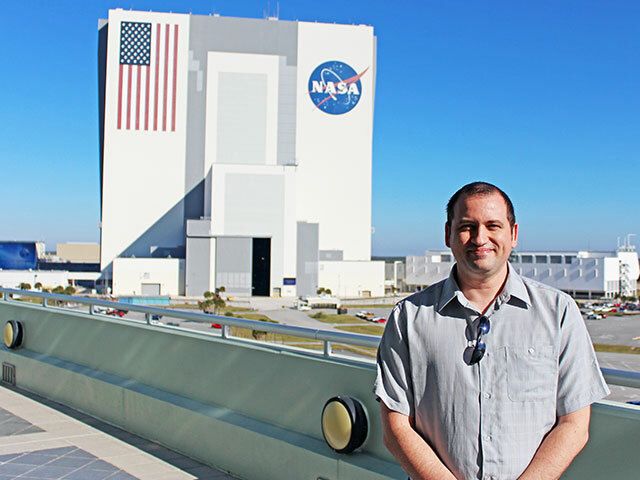 “Science always fascinated me and I was curious to know what happened behind the scenes of everyday processes and beneath the surfaces of technologies,” said Mugwisi. Motivated by his curiosity and those interests, he earned the highest ever test results on the national exams at his high school, leading to a Joshua Nkomo Scholarship, one of the most competitive scholarships in Zimbabwe. As a senior Mugwisi earned perfect test scores in the natural sciences and graduated a term early. 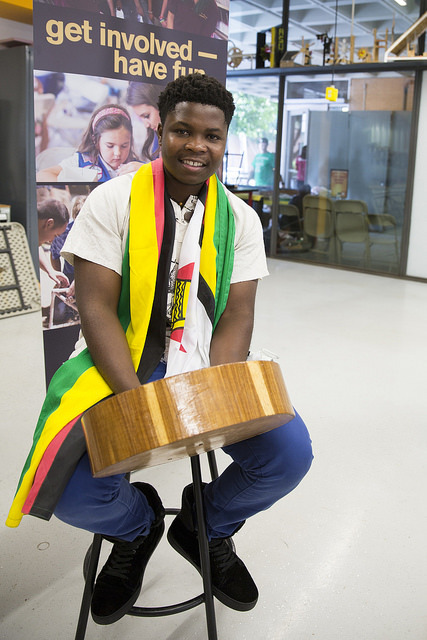 His performance made him one of 32 Zimbabwean students to be selected for the 2012 class of the United States Students Achievers Program, which helps African students to apply to U.S. universities. 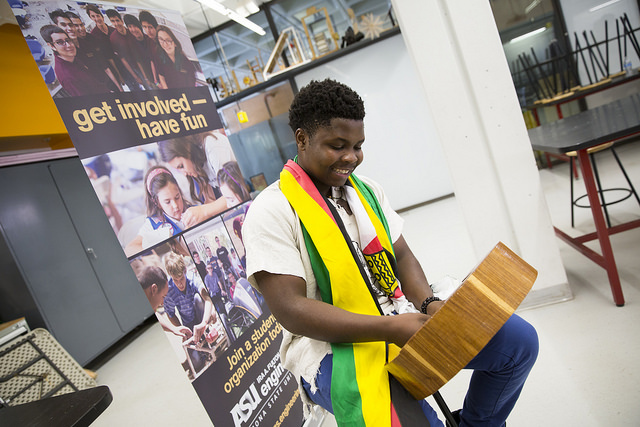 ASU’s commitment to the ideals of the “New American University” appealed to Mugwisi, particularly its emphasis on local impact, social embeddedness and accessibility for students from all walks of life. He was also attracted to ASU because of the academic, entrepreneurial and leadership opportunities it offered. “At ASU I knew I would find a nurturing climate that would propel me to succeed as an entrepreneur,” Mugwisi said. He made his way to ASU with a full-ride scholarship from the MasterCard Foundation Scholars Program — a $500 million, 10-year initiative to educate and prepare young people, particularly from Africa, to lead social change and make a positive impact on their communities. The commonplace hunger Mugwisi experienced as a child living in poverty has evolved into a passion for improving communities through social entrepreneurship. As a freshman at ASU he started the Stair Gardens Project (SGP), a sustainable food source venture that uses a tiered gardening system to empower small-scale rural farmers to increase their food production. The venture was started in conjunction with the Fulton Schools’ Engineering Projects and Community Service (EPICS) program. The system enables people in rural areas, including many areas across Africa, to sustainably grow vegetables despite limited access to water and fertile soil. The tiered agricultural approach saves land space while increasing the output of vegetable harvests, despite using only small plots of land. SGP won against 191 other ventures competing at the 2015 Social Venture Challenge, held in conjunction with the Clinton Global Initiative University (CGI U) conference at the University of Miami in March 2015. “With the seed funding we earned we transformed SGP into a spinoff venture called Solar Water Solutions and successfully implemented the first phase of the product design in Zimbabwe in summer 2015,” said Mugwisi. Solar Water Solutions also won a $1,000 prize in the Fulton Schools Startup Center’s recent eSeed Challenge. Mugwisi’s determination and commitment to serving others earned him three EPICS awards in two years, including the Global Impact Award for the SGP venture. After his team’s performance at CGI U, Mugwisi won a Resolution Fellowship, which is given to young social entrepreneurs by The Resolution Project to help connect them with an array of resources for support through the nonprofit’s network. The Resolution Project aims to generate leaders with a lifelong commitment to social responsibility. Mugwisi is co-founder of two ASU student organizations, Diners We Care, a food waste reduction and diversion initiative, and Africa Rises, which provides African students with a platform for self-representation and for correcting stereotypes about themselves and their countries. He also serves as the Region 6 Programs chairperson for the National Society of Black Engineers. He develops and implements programs to promote academic excellence, education outreach and pre-collegiate engagement for the society in 11 states. He is also a mentor to fellow students in the School of Electrical, Computer and Energy Engineering, and chair of the ASU chapter of the Institute of Electrical and Electronics Engineers (IEEE). 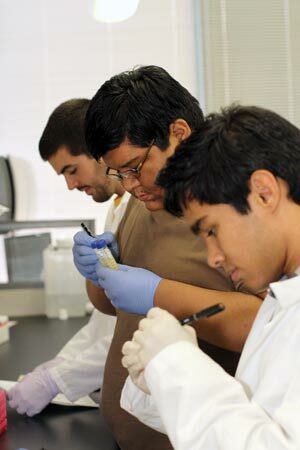 Mugwisi conducted undergraduate research through the Fulton Undergraduate Research Initiative (FURI) for two semesters under the supervision of Jean Andino, an associate professor of chemical engineering. His research focused on experimental studies of carbon dioxide photoreduction employing titania-based catalysts to create alternative energy sources. In addition to developing initiatives to give back to his home country and other developing nations, Mugwisi connects with his home country through music. He enjoys playing the mbira, a traditional African musical instrument also known as the thumb piano. He recently performed at the Fulton Schools’ ASU homecoming block party and at a reception at the Zuva Gallery in Scottsdale. “It is my own serene way of balancing my busy life. I am glad a number of people I have played for share the same love for the music,” he said. Mugwisi is on track to graduate in May 2017 and plans to attend graduate school.